Omg, what a idea to make sambar oats, Great one Harini. Such a lip smacking recipe with oats, great alternative to the bland oatmeal. Serve me this fibre rich sambar oats with some pickle, i can sit and finish this ultimate dish without any fuss. LIpsmacking here. Oats sambar ! Omg ! How innovative ! Seriously hats off to your creativity , loving the idea of Sambar oats . Sounds and looks awesome ! wow I second vaishali. This is great idea. I end up making upma kind or sweet kanchi kind. This is so good. oh ! I need just this push when a one pot meal looks like the only dish I can rustle up ! bookmarked.. do u roast the oats, Harini ? I make sambhar rice with other grains though never prepared it this way pouring sambHar over oats. What a good way to use left over sambhar. 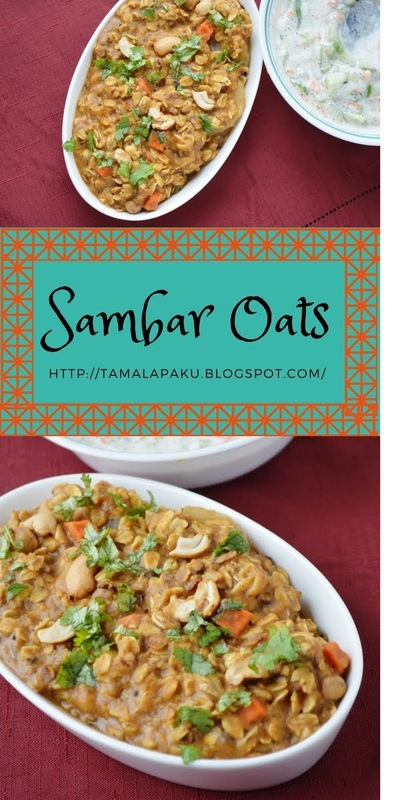 I have recently started eating oats more regularly and this sambar oats sound just perfect to try some time soon. I would love to try this real soon. Lovey fusion dish for weight watchers.. Superb share..
Wow sambhar with oats, that is one interesting fusion recipe to use sambhar and oats together. Just like sambhar sadam it must be delicious. That is an amazing dish to whip up with left over sambar. So healthy and absolutely yum.. I just couldn't believe my eyes when I saw oats with sambar. Wow, Harini...what a great way to enjoy oats. This is a great idea for savory breakfast. I am a biog fan of savory breakfast and usually have oats with buttermilk and seasonings. This is a great choice to use sambhar. Quick and easy to make. Haha! I am like your kid, will eat any meal if it has pappad! I like oats only in savory dishes and this one looks absolutely inviting Harini! Awww, this is superb !! using leftover sambar to jazz up oats!!! oh yumm it looks, thanks for the idea!